suits were already placed to represent them, then exchange those for the suits in which each of them makes his first lead. The foregoing method is to be taken when more necessary to record your adversary's first lead than to endeavour to find out a revoke. 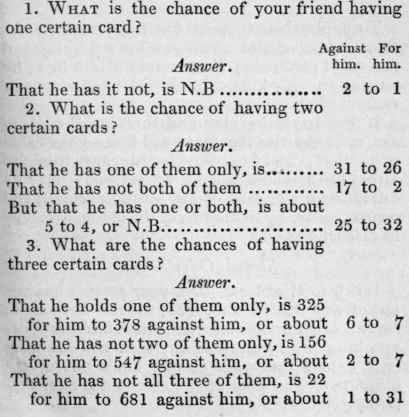 CALCULATIONS SHEWING THE CHANCES OF YOUR PARTNER HAVING ONE, TWO, OR THREE CER­TAIN CARDS. Read with attention those marked N.B.